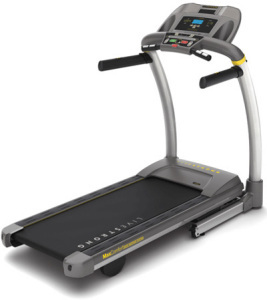 Treadmills are probably the most popular pieces of exercise equipment we sell. They are easy to use and effective calorie burners for most people. There are many types of treadmills: fold-up models, models designed for walkers, heavy-duty designs for runners, even ones that can monitor your heart rate and adjust your workout accordingly! Your treadmill needs a strong motor. Check if your treadmill motor has CONTINUOUS-DUTY horsepower – this is the power a treadmill can sustain continuously, for 24 hours of non-stop use. High continuous HP typically means the treadmill can work efficiently and powerfully under more weight, and that it’s easier for the treadmill to maintain a steady speed with the harder impacts at higher speeds. 1.5 Continuous-duty horsepower or higher would be recommended for most users. Treadmills typically run from 0 to 10 mph. Some will go as high as 12 mph. If you don’t plan to run, there are models built specifically for walking. Again, it comes down to finding the model that suits your particular needs best. Do check that a treadmill has a low starting speed, so you won’t be jolted off balance by a sudden start. Most better quality treadmills are equipped with a range of pre-set programmes, essentially a series of varying resistances designed to simulate differing uphill gradients. Programmes let you choose the level of intensity for your workout—and also vary your workouts so your exercise program is never a dull routine. A smaller treadmill may suffice, but it won’t cope with a 6-foot-plus or 20 stone user. Most Home treadmills can fold to save on space when not being used but if you are a serious runner you may find a fixed deck machine more practical and durable. Treadmills carry varying warranties — from 90-days to lifetime coverage on different parts of the Treadmill. For example, parts and labour may be covered for 6 months, electronics for 1 year, and the frame for a lifetime. In general, keep in mind that a longer warranty is indicative of a higher quality machine. Most of our machines carry 2 years parts and labour manufacturer’s warranties. We are always happy to offer advice and guidance and the best thing is its FREE.